Coffee Mugs Johannesburg – A branded coffee mug is a hot commodity in an office. It’s often the case that everyone has their own specific mug that they prefer, and will only use that one. This makes Coffee mugs such a brilliant promotional item! A coffee mug is something that people can get very specific about and that they like to claim as their own. At Corporate Gifts Johannesburg we have a large selection of gorgeous, customizable coffee mugs for you to choose from, in a rainbow of colours. Different shapes, sizes, novelty features and a range that extends from a standard ceramic mug to a Car Charger Double Wall travel mug that you can keep warm on your commute. 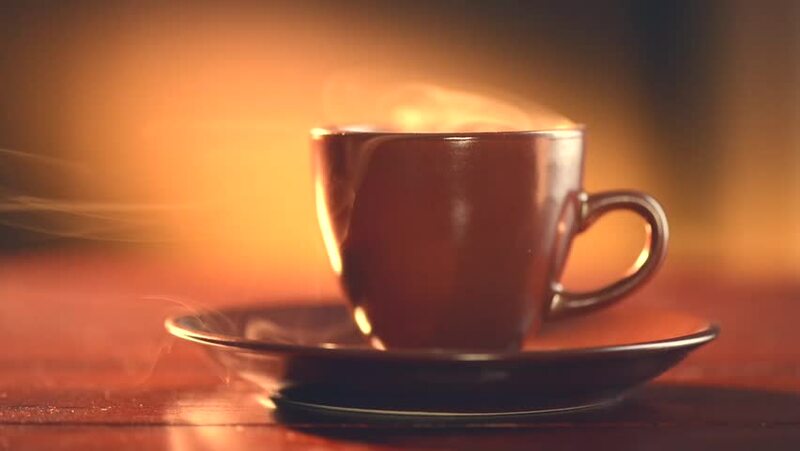 Many people like to have a warm beverage while they’re at work, whether it’s coffee, hot chocolate, or whichever flavour of tea you prefer, a mug is the right tool for the job and it makes it that much better when the mug is specifically yours. Personalised Coffee Mugs are the best way to curb any debate as to whose mug is whose. We can print your mugs with both your brand as well as individual names. This brings the ultimate personal touch to a mug. Statistics state that customers who receive a gift from a company are twice as likely to feel appreciated by that company. Just imagine how much more true that would be if you gave your clients a personalised mug. It really gives a gift that touch of personality and lets the person you’re gifting know how much time and thought you put into getting them a present that is just right for them. They also make for stunning staff gifts. At Corporate Gifts Johannesburg, we have personalised mugs and we really enjoy them. It really can make your staff feel appreciated and like they have been individually acknowledged when they are gifted with a mug that is specifically. When you’re looking for a great, multipurpose gift that has an individual touch, a great choice is Personalised Coffee Mugs. Sublimation Rim Mug – Sublimation is the process of printing whereby the ink is heat sealed onto the mug. The Rim mug as colour on both the handle and the rim of the mug, which is where it gets its name from. These are one of our most popular mugs. They look fantastic, the colour is great and so is the printing. We’re very fond of our Rim Mugs. The mug itself is white and comes with black, navy blue, sky blue and red accents. It can take a full colour sublimation print with your brand on one side and a personalised name on the other side in a variety of fonts. This mug is one that we have tried and tested ourselves and we recommend the Sublimation Rim Mug. Mug and Spoon Sets are a super neat gift. It saves the hassle of looking for something to stir your sugar in with when it’s always there waiting for you. 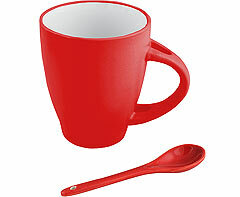 This gorgeous mug has notches in the handle to store its matching coloured spoon in. 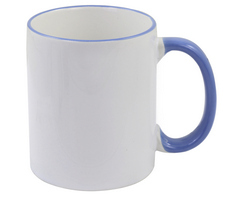 The outside of the mug is matte in either red or blue and the inside is white, with a capacity for 300ml of liquid. This mug makes a particularly good gift because it comes as a complete set by itself, it comes in a gift box and it looks very put together and neat. By itself, it makes a complete gift, which is part of what makes it so wonderful. Magic Mugs are amazing. A great way to surprise your clients with a gift is to get them a black or blue coffee mug. This mug seems ordinary until boiling water is poured into it. At this point, the heat activates the colour change and the white mug and your logo are revealed beneath the other colour! Just like magic! This makes it a fantastic gift. It has a great, fun feature that not every mug has in that it can reveal a hidden brand like a magician making his assistant appear out of thin air, and it has the more practical function of letting you know when your coffee is cold. The Heat change Sublimation Mug makes for a lovely gift and it’s one of our mugs that can be personalised as well! So you have the option of a full colour wrap around sublimation or a personalised, Colour Changing Coffee Mug. 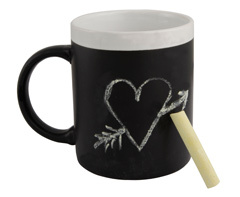 Chalk Board Mugs are a lot of fun. It’s a great way to leave someone a little message. Maybe your co-worker is having a bad day? A cup of their favourite hot beverage with a personal message to let them know that things will get better can really lift their spirits and is a thoughtful way to show them that you care. After all, your colleagues are the people that you spend some of the most time with. With a chalk mug you can claim a mug as yours for the day, you can write down the way you like your drink so that that no one gets the wrong cup. There are so many different uses for this mug, and so many fun applications. You can have a different witty slogan on your cup every day of the week with a Chalk Mug. 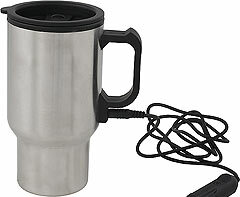 Stainless Steel Travel Mugs are great way to keep your coffee hot while you’re on the road. A way to maximise that capacity for heat retention is with a double walled mug that will keep the heat in and can be also be plugged into your car lighter to keep it hot for when you get into the office. 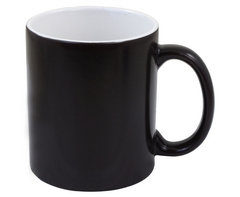 This mug looks sleek and professional and makes for an awesome gift. At Corporate Gifts Johannesburg, we have a wide variety of mugs for you to choose from and are proud to be able to offer you these choices to make your brand stand out on your perfect coffee mug. To place an order, or to get more information about what we have to offer you can email info@brandinnovation.co.za and we will be glad to assist you. We are proud to offer you this range of top quality Coffee Mugs Johannesburg.